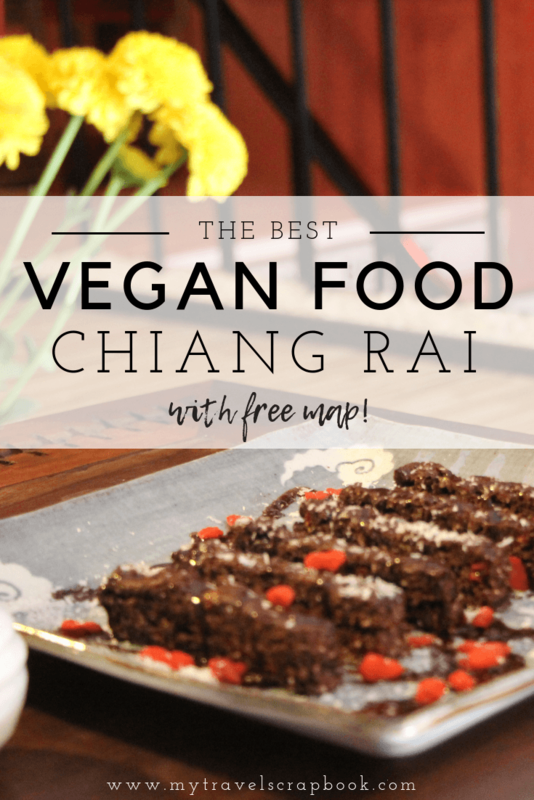 3 places to try Vegan Food in Chiang Rai and where not to go! Chiang Rai is a city in the far north of Thailand. Whilst there may not be as many vegan places as the larger similarly named city of Chiang Mai there are still plenty of options for vegan travellers. Here are 3 places that you must try whilst you are in the northern city and one place to definately avoid! Read on to find out where the best vegan pad Thai is, where you can eat whilst watching locals dance and where to find a sugar free vegan chocolate cake! 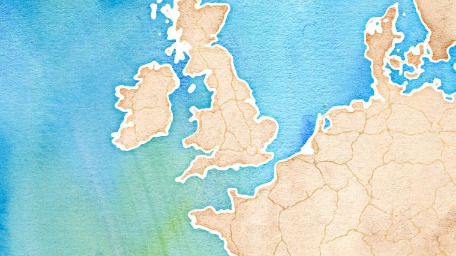 Scroll down for a free map which show where these restaurants and cafes are located. 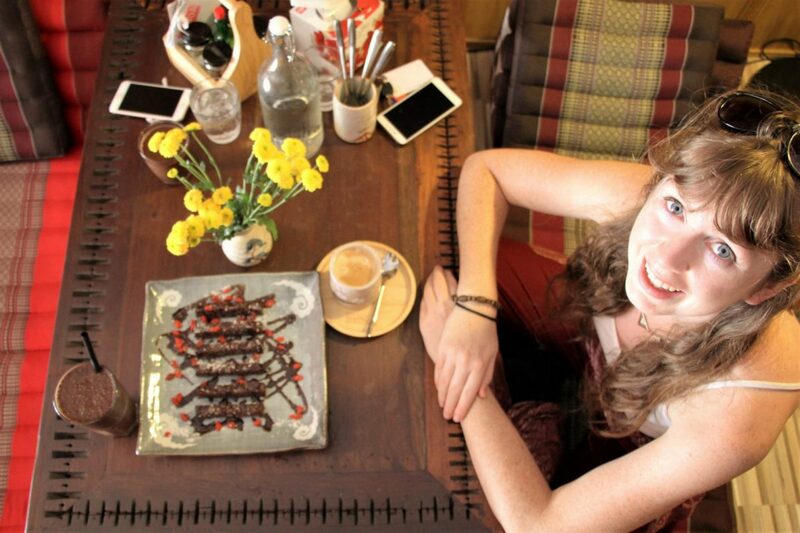 Chiang Rai’s best vegan chocolate cake! 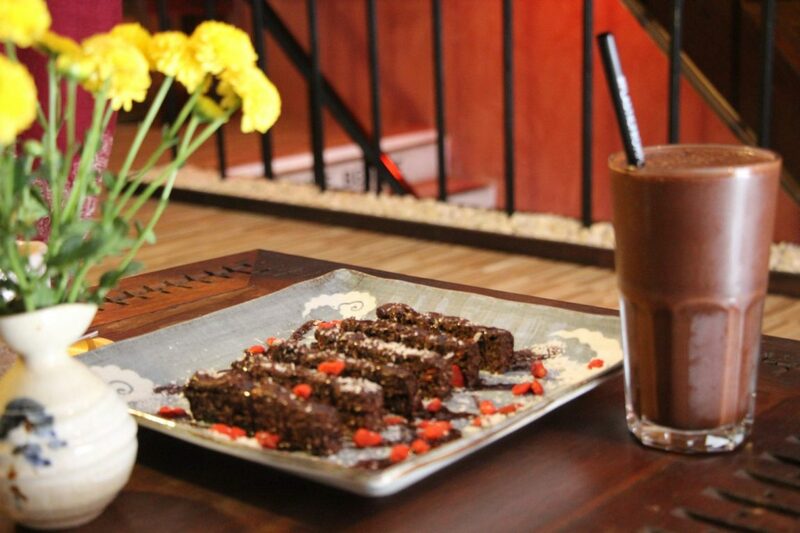 Kunda Vegan Vegetarian cafe is very new to the veggie scene in Chiang Rai. 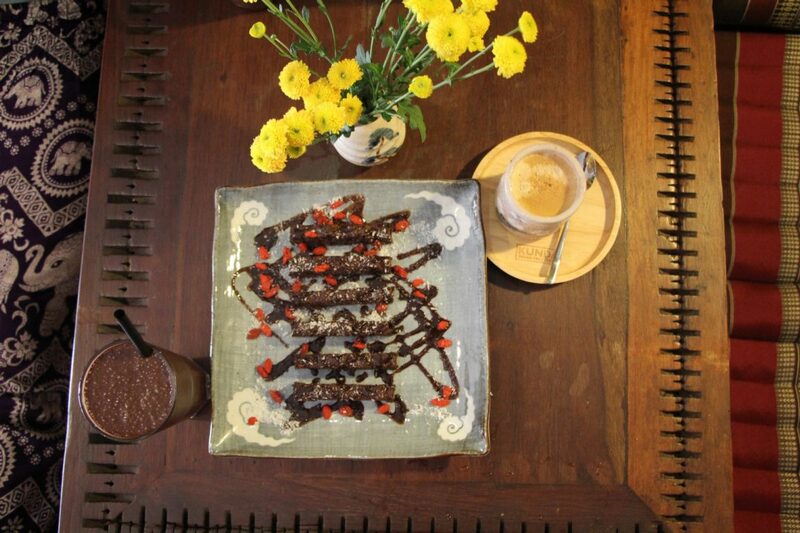 Kunda started in the south in Koh Lanta and have just opened in Chiang Rai. Expect a hippy, Tibetan feel as the lulling of Buddhist chants fills the restaurant. Feel yourself start to meditate slightly as you ease yourself down onto the comfy and colourful cushions on the floor. All around the walls are Tibetan flags and decorations. The owners were incredibly welcoming and made sure we had everything we needed! We went for an afternoon snack after an incredible morning at the Elephant Valley Sanctuary. I opted for the vegan chocolate cake with a coffee whilst Alex opted for the chocolate passion smoothie. Everything was so delicious, and the portions were huge. They had made too much smoothie meaning I was given a small portion of it too! The smoothie was thick and creamy. The cake was dense and sugar free! Kunda is on the pricier side but makes a lovely treat. 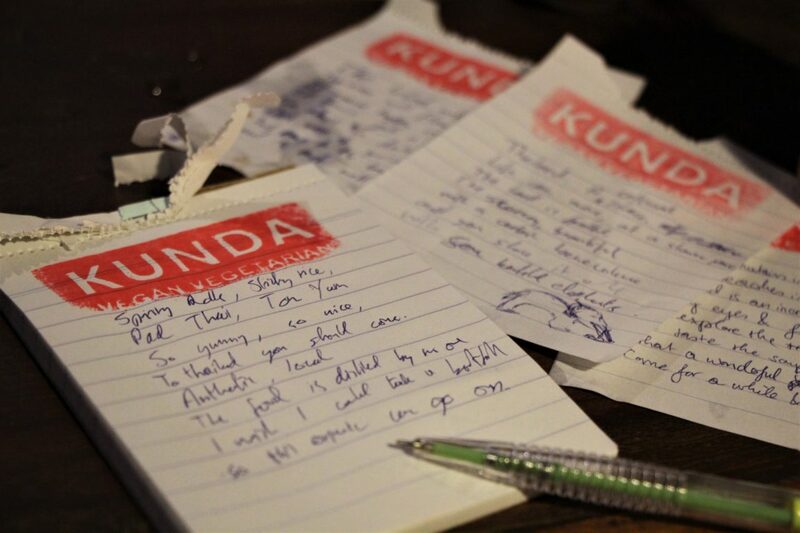 Kunda was my favourite café in Chiang Rai. Chiang Rai’s best Pad Thai! This little unassuming place serves one of the best vegan pad thai’s in the whole of Thailand according to a review on Happy Cow! The restaurant is called Pad Thai but that is not the only thing they serve. There are plenty of traditional Thai dishes and most can be veganised. Alex and I were boring as we both very much wanted a Pad Thai! The restaurant is run by a lovely old couple. The elderly lady can barely see bless her but speaks good English. We were served peanuts as a starter whilst enjoying a Chang beer. Our meals arrived quicky and smelt incredible. 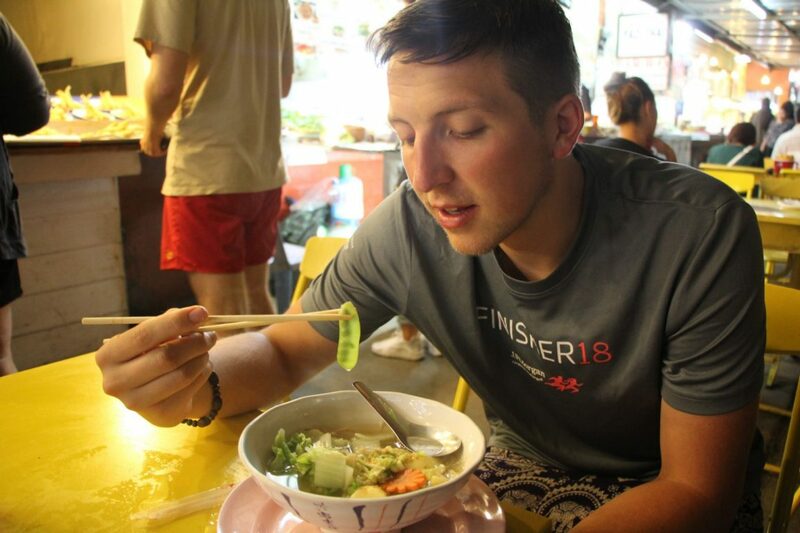 The pad thais were absolutely delicious…Alex very much wanted another portion. We were given watermelon for dessert as we watched the dog and cat chase each other around the little restaurant. They have wifi and were playing planet of the apes on the TV whilst we were there! I even asked if they had a needle and thread as one of our baggy trousers had a whole in it. She happily supplied the thread and needle but not before a short English lesson asking what they were called and writing them down (it took a few attempts to get the spelling of thread correct – cheers English language!). I then asked what they were called in Thai. I sat there and sewed up the trousers whilst Alex tucked into the watermelon. I nearly had another tear as the cat thought the waving trousers were play things! So, I sat cross legged with the clothing on my lap and fixed the harem pants. I gave a little extra for the thread and we left with full bellies of delicious vegan pad thai. I would thoroughly recommend Pad Thai for a delicious pad thai! Don’t bother with Oasis. The restaurant has no prices on the wall and it seems to be inconsistent what costs what. Alex thought it was an all you can eat buffet and the lady said you can 1,2, 3 or 10 dishes! Their English was very poor when we were trying to ask how much. It turns out even if you have one tiny spoonful of one dish you will be charged the same for that as if you had just a huge bowl full of one dish. The food was quite bland and cold. It is very centrally located but I would not recommend when there are so many other places to try. 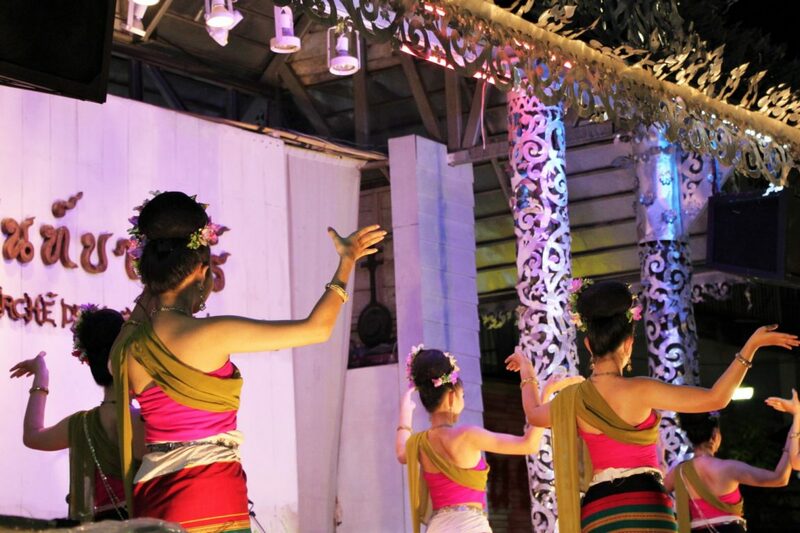 You must visit the Night Bazaar during your stay in Chiang Rai. There are plenty of vegan options to try at the various stalls. Chiang Rai’s night market is conveniently located in the centre of the town, very close to the bus station. There is a wide array of souvenirs from colourful coconut balls to hill tribe wares. There is also a huge food court with food vendors on either side, a stage at the top and plenty of seats in the middle. Walk around the side to see what dish you fancy then grab a chair and enjoy the various songs and dances performed on the stage. 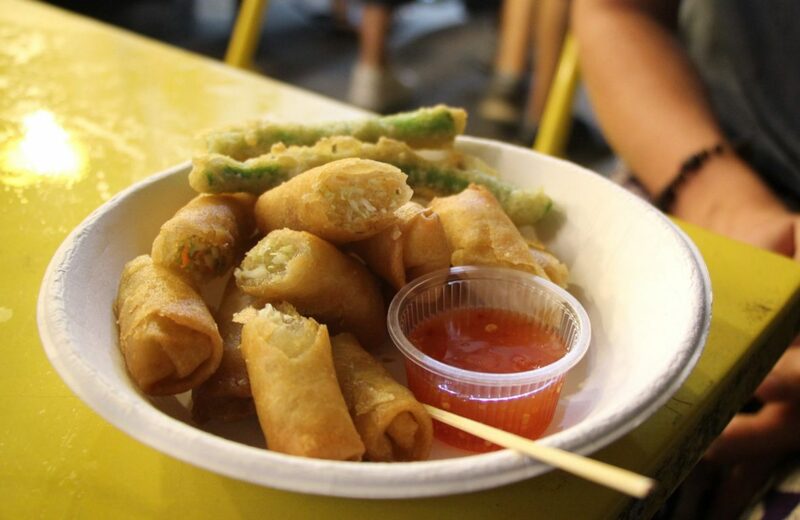 We snaked on piping hot spring rolls, battered vegetables, yummy soups and tasty noodles. The atmosphere is fantastic, and the food is cheap. We visited Chiang Rai as part of a 3 week trip around Thailand. We ate so much yummy vegan food around the land of smiles and Chiang Rai did not disappoint. There were many more veggie places to try in Chiang Rai but we only stayed for two days so sadly could not try out more places! 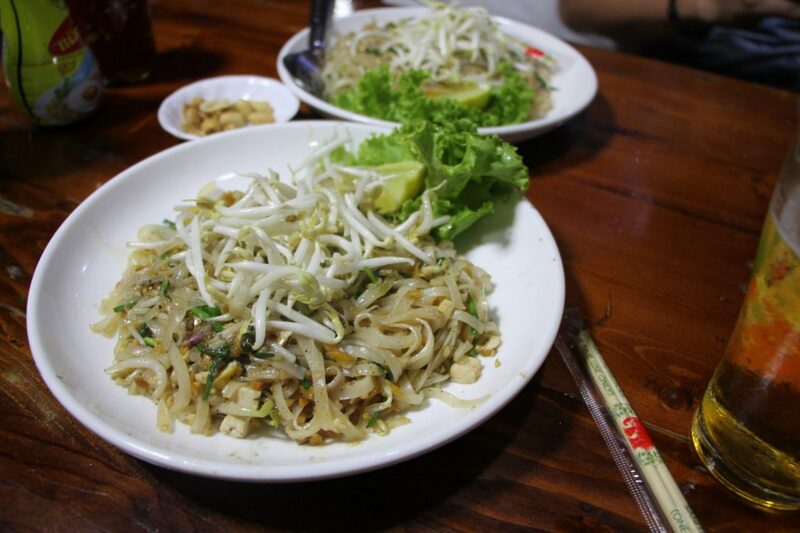 Hope this post has made your mouth water and helps you plan where to eat as a vegan in Chiang Rai. Which restaurant would you most like to visit? Let me know in the comments below!